MARY O SMITH GRADUATED FROM LOUISIANA STATE UNIVERSITY IN 1982 WITH A BACHELOR OF DESIGN AND WORKED AS AN INTERIOR DESIGNER AND ARCHITECTUAL RENDERER FOR MANY YEARS IN GEORGIA. 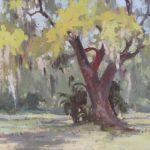 SHE PAINTS FULL TIME AT HER STUDIO IN WOODBINE, GEORGIA WHEN SHE IS NOT PAINTING IN PLEIN-AIR. 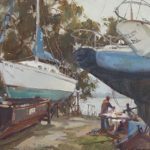 PAINTING IN BOTH WATERCOLOR AND OILS HAS GIVEN HER AN EXPRESSION OF HER DESIGN SKILLS. 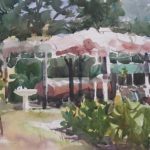 Hey, just wanted to tell the Darien group that I won an Honorable Mention for a watercolor that I painted in Steinhatchee, Fl. in the 26th Tri-State Water Media Show in Tallahassee, FL. The show is at the Florida State University Fine Art Building. You can see the show online. www.tallahasseewatercolorsociety.com So thrilled. It was a tri-state entry of Florida, Georgia, and Alabama.